Alicia Sledge (left) and Julie Roth of the Michigan Office of Highway Safety Planning present a national traffic safety award to the Kent County Sheriff’s Office. Photo courtesy of OHSP. 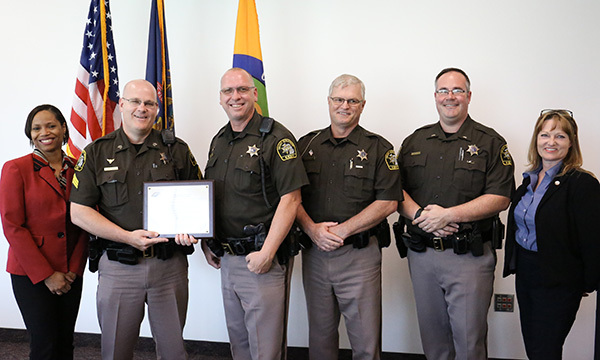 The Kent County Sheriff’s Office Secondary Road Patrol (SRP)/Traffic Safety Unit has received the Salute to Law Enforcement Officers Award from the National Association of Women Highway Safety Leaders (NAWHSL). The Michigan Office of Highway Safety Planning (OHSP) presented the honor during a ceremony on Thursday, May 18, on behalf of the association. “The award recognizes Kent County’s continued strong commitment and dedication to traffic safety,” said Michael L. Prince, OHSP director. The Secondary Road Patrol and Traffic Accident Prevention Program provides county sheriff’s offices with funding to patrol county and local roads outside the corporate limits of cities and villages. The state grant program, managed by the OHSP, has the legislated primary responsibility of traffic enforcement and traffic crash prevention on secondary roads. Deputies funded under the SRP program are responsible for traffic enforcement, traffic crash prevention and investigation, criminal law enforcement and emergency assistance to stranded motorists on secondary roadways. In 2016, the Kent County SRP Traffic Safety Unit investigated 35 fatal traffic crashes, including alcohol- related crashes. “Traffic safety remains a top priority in Kent County. We are always seeking innovative ways to address this ongoing problem,” said Kent County Sheriff Lawrence A. Stelma. The department has focused on drugged driving enforcement through its three Drug Recognition Expert (DRE) deputies. A DRE is a law enforcement officer trained to identify people whose driving is impaired by drugs other than, or in addition to, alcohol. Stelma said deputies in the Traffic Safety Unit also have the equipment and training to precisely measure and map crash scenes. This data is a vital investigative tool for criminal prosecution. The unit has also established an online school bus red light violating reporting system that is used by bus drivers. Reports are investigated by a deputy with proper enforcement action taken. 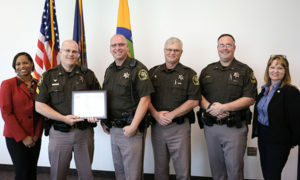 “We are grateful to receive this national honor and appreciate the ongoing support of the OHSP,” said Stelma. The NAWHSL disseminates information and educational programs to promote safe traffic behavior and advocates for effective public programs to reduce motor vehicle related crashes, crash severity and the resulting deaths and injuries.